Reading and share top 20 famous quotes and sayings about Hezbollah by famous authors and people. 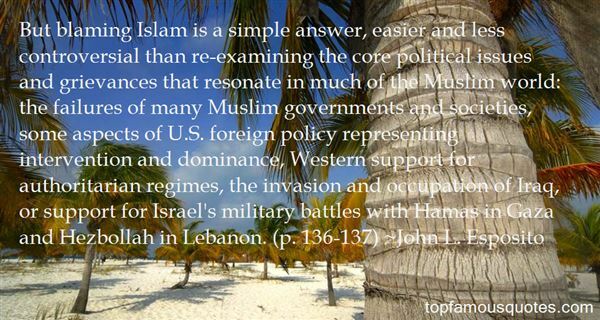 Browse top 20 famous quotes and sayings about Hezbollah by most favorite authors. 1. "The actions of the terrorist organizations, Hezbollah, in Lebanon, and Hamas, in Gaza, against Israel are unconscionable. Instead of working towards peace, these terrorist organizations have chosen to perpetuate the violence." 2. "Vegetarians, and their Hezbollah-like splinter-faction, the vegans, are a persistent irritant to any chef worth a damn. To me, life without veal stock, pork fat, sausage, organ meat, demi-glace, or even stinky cheese is a life not worth living. Vegetarians are the enemy of everything good and decent in the human spirit, an affront to all I stand for, the pure enjoyment of food. The body, these waterheads imagine, is a temple that should not be polluted by animal protein. It's healthier, they insist, though every vegetarian waiter I've worked with is brought down by any rumor of a cold. Oh, I'll accomodate them, I'll rummage around for something to feed them, for a 'vegetarian plate', if called on to do so. Fourteen dollars for a few slices of grilled eggplant and zucchini suits my food cost fine." 3. "Hezbollah-controlled Lebanon now presides over the UN Security Council. This means, in effect, that a terror organization presides over the body entrusted with guaranteeing the world's security. You couldn't make this thing up." 4. "In my judgment, the greatest risks are international terrorist groups like al Qaeda and Hezbollah. The war in Iraq has taken our attention off those priorities." 5. "The little boats cannot make much difference to the welfare of Gaza either way, since the materials being shipped are in such negligible quantity. The chief significance of the enterprise is therefore symbolic. And the symbolism, when examined even cursorily, doesn't seem too adorable. The intended beneficiary of the stunt is a ruling group with close ties to two of the most retrograde dictatorships in the Middle East, each of which has recently been up to its elbows in the blood of its own civilians. The same group also manages to maintain warm relations with, or at the very least to make cordial remarks about, both Hezbollah and al-Qaida. Meanwhile, a document that was once accurately described as a 'warrant for genocide' forms part of the declared political platform of the aforesaid group. There is something about this that fails to pass a smell test." 6. "That is why if Lebanon concludes a peace agreement with Israel and brings that accord to the Parliament our deputies will reject it; Hezbollah refuses any conciliation with Israel in principle." 7. 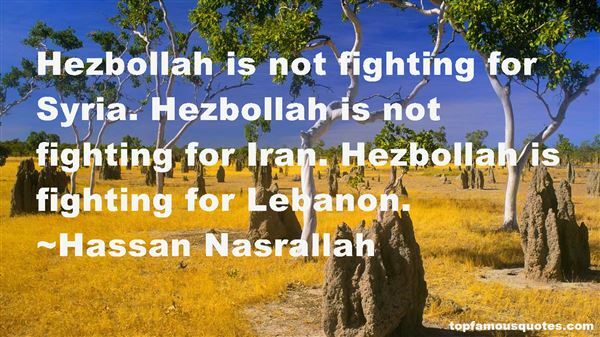 "Hezbollah is not fighting for Syria. Hezbollah is not fighting for Iran. Hezbollah is fighting for Lebanon." 8. 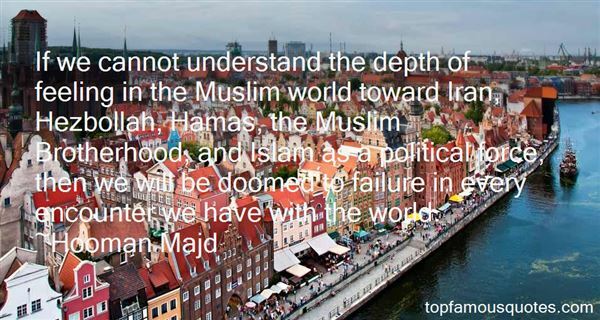 "If we cannot understand the depth of feeling in the Muslim world toward Iran, Hezbollah, Hamas, the Muslim Brotherhood, and Islam as a political force, then we will be doomed to failure in every encounter we have with the world." 9. "As in any war, there have been dreadful mistakes and civilian casualties. The difference is when Israelis kill innocents they apologize; when Hezbollah kills innocents they celebrate." 10. "None of us condone terrorism in any way, shape, or form, and I believe Hezbollah is a terrorist organization that was, is, and remains a threat to peace in the Mideast, and must be dismantled and disarmed." 11. "But blaming Islam is a simple answer, easier and less controversial than re-examining the core political issues and grievances that resonate in much of the Muslim world: the failures of many Muslim governments and societies, some aspects of U.S. foreign policy representing intervention and dominance, Western support for authoritarian regimes, the invasion and occupation of Iraq, or support for Israel's military battles with Hamas in Gaza and Hezbollah in Lebanon. (p. 136-137)"
12. "There's Hezbollah, there's Hamas, there is a whole range of terrorist targets out there related to Palestine and to Israel that we ought to be trying to deal with. And there's a great deal of targets in the Philippines, Indonesia. You name it, there are a number of places where there are targets that we ought to be trying to deal with." 13. "Unlike Hezbollah, Israel's more modest aim is to survive, and that it has done." 14. "The President of Iran has called for the destruction of Israel and the West and has even denied the holocaust took place. Iran and its terrorist arm Hezbollah are responsible for the current conflicts between Israel and Lebanon." 15. "Every victory of Hezbollah, I celebrate." 16. "The elite are the men of religion, political leaders, media and press people, and teachers. Everyone can understand the truth and know what is right. These have the responsibility of showing this right and truth to the people. They should not remain silent....It is the responsibility of people to look for right and truth. As they hear me now, they should not accept everything I say. Even the masses of Hezbollah and the resistance should not do so....Forget what my faith is and what yours is. Hear what I say and see what I do and hear what others say and see what they do, and then decide." 17. "Hezbollah's contempt for human suffering is total, as it showed once again this morning when its rockets murdered two Israeli Arab children in Nazareth." 18. "But Hezbollah now has reared its ugly head in a way that threatens the entire free world. And they want, by their own charter and definition, the destruction of Israel and Christians. That is the truth. That is in their charter." 19. "Biggest mistake Reagan ever did re: foreign policy? 1984 decision to appease Hezbollah with Lebanon withdrawal"
20. "The Lebanese banking system helps Iran, Syria & Hezbollah evade sanctions." Don't seek to be the loudest voice in the room, but seek to be a clear distinctive voice."